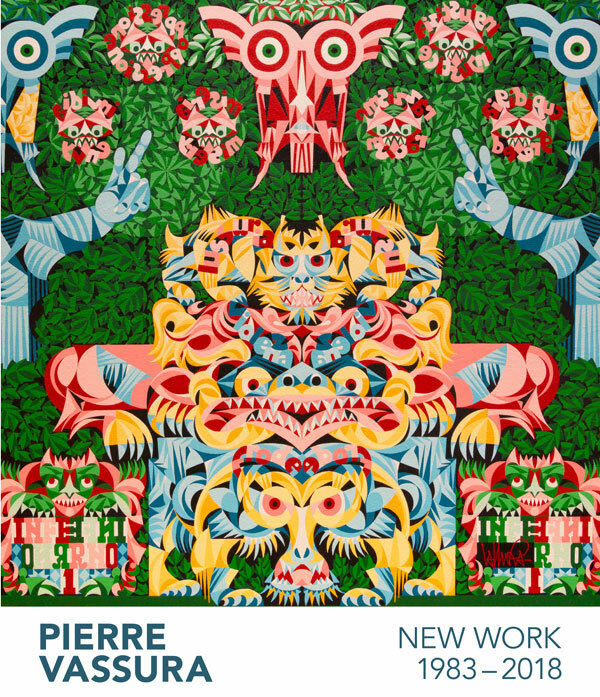 The Richmond Art Gallery is proud to present the first solo exhibition by Richmond artist Pierre Vassura. 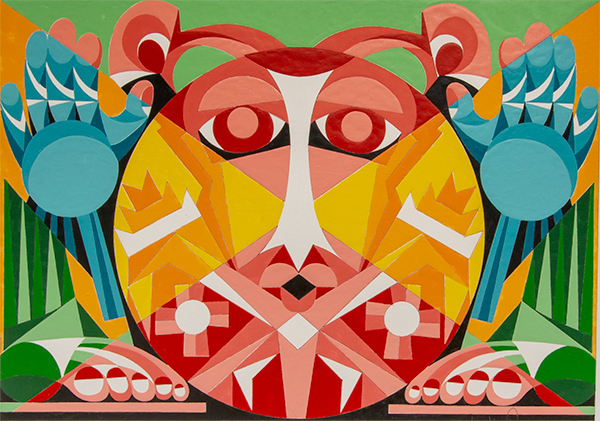 Over forty years in the making, the exhibition will showcase a range of sculptures, paintings and drawings, highlighting a strong graphic style and vibrant use of colour. Many of Vassura’s paintings are in series, like classic grand narratives, and the sculptures shown will include puppets and purpose-built stages. These artworks are a joyous celebration of storytelling and visual culture that cross national, cultural and language boundaries, drawing from diverse sources. Vassura evokes classic literature including the Decameron, The Divine Comedy and Aesop’s Fables, as well as referencing the Tarot and stories from The Bible. The title New Work is usually applied to an exhibition of a recent body of work within the span of an artist’s career. Vassura’s work is, however, new in that this is its first public exhibition in that time. The title also points to the inventiveness of Vassura’s practice combining important influences and ideas in a way that feel rather singular, and indeed, new. The exhibition is accompanied by a short essay by Eli Bornowsky. Pierre Vassura was born Romagna, Italy in 1935. The son of an architect and teacher, he enrolled in agricultural studies following the death of his father at age thirteen. Farming was not his passion however, and at age twenty Vassura moved to France in search of artistic experiences. He first secured work as a ceramic designer at the Faiencerie de St. Clement, and later a ceramic studio in Cote d’Azure, Vallauris-Juan les Pins. Vassura became a technical and production expert in several ceramic factories in Switzerland, France, Italy and Israel and he participated in Israel’s vibrant emerging ceramics industry with Palceramic in Haifa. With the Beit-Hagefen Art Gallery, Vassura first exhibited his paintings in Tel-Aviv and Haifa from 1963 to 1965. In this fruitful period, Vassura also met his future wife, Fotiny with whom he would have two children. In the early 1980’s Vassura and his family moved to Richmond, BC. In 2002, Vassura exhibited a mature body of work at Vancouver’s Italian Cultural Centre, Pierre Vassura: New Work 1983 – 2018 is his first major solo exhibition. Born in Alberta, Eli Bornowsky received his BFA in Visual Arts from the Emily Carr Institute in Vancouver (2005) and completed his MFA at Bard College, New York (2014). His paintings have been exhibited widely, including Richmond Art Gallery, the Contemporary Art Gallery, Vancouver Art Gallery, Western Front, Burnaby Art Gallery, Ottawa Art Gallery, G Gallery, Diaz Contemporary, and the National Gallery of Canada. Bornowsky has curated exhibitions at the Or Gallery including a series of experimental sound performances and his writing has been published in several art catalogues and in C Magazine, Pyramid Power, Fillip Review, Setup, and the Bartleby Review. He currently lives in Brooklyn, New York. Jonathan Middleton is an artist, curator, and publisher based in Vancouver. Middleton served as Director/Curator of the Or Gallery (2007-2017) and the Western Front Exhibitions Program (1999-2005). He was the founding publisher of the art periodical Fillip (2004-2008) and currently works as co-director of Information Office, a design and publishing studio focused on the contemporary visual arts. Middleton is a member of the Duplex Artists’ Society and has presented his own work at the Contemporary Art Gallery (Vancouver), Vancouver International Film Festival, Chicago International Film Festival, VIVO Media Arts, and Tracey Lawrence Gallery, among others. Above: Selection from "Analogies of Aesop’s Fables," enamel on paper mounted to card, typewritten cards, 44 cm x 58 cm.